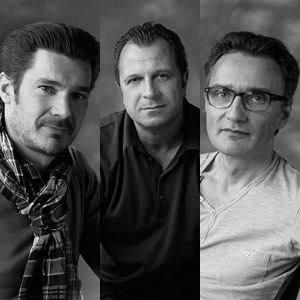 The tr(oi)ka was founded by Aurel Aebi, Armand Louis and Patrick Reymond in La Neuveville, Switzerland, in 1991 under the label Atelier. The main elements that characterise the Atelier's philosophy and work consist of its multidisciplinary nature. Orders come from the fields of architecture, design and scenography, and, most frequently, from between these different disciplines. Invited to various design schools in Switzerland and abroad, they hold a teaching position in the design department of Ecal (University of Art and Design Lausanne, Switzerland).